Established in 1985, The Gold Room brings Westland’s rich gold mining story to life as beautiful jewellery crafted from the locally found natural gold nuggets and flakes. Our philosophy, when creating jewellery with natural gold, is to leave the nuggets in their original state, preserving the unique raw forms, from the ground. When working with the natural gold nuggets and flakes, to make beautiful jewellery that is not only different but very wearable, many of the innovative designs incorporate prized gemstones, elegant gold work and of course imagination. Each piece of beautiful jewellery is designed to express the nuggets own individual character. If you are visiting, the shop is open 7 days a week and offers a unique opportunity to see local, natural gold nuggets straight out of the ground and made into stunning nugget jewellery. 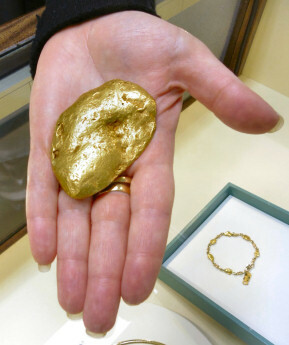 You are welcome to hold one of the large, real, natural gold nuggets in your hand and feel the amazing weight of gold. Photos and artifacts of current and historic mining, adorn the shop and we often have antique scales for sale. There are also two, 3 meter long gold mining models with miniature sluice guns, gold dredge, gold miners, and water wheels to view, and a recent addition, of a scale model gold stamping battery. You can also purchase your own gold pan to try your luck, in one of the public gold panning areas nearby. We are located in the heart of the craft mecca in Hokitika, 37 Tancred Street. Watch our in house jeweller working with the natural gold, creating that exclusive piece of unique nugget jewellery. You are welcome to view our jeweller as he works at his bench. 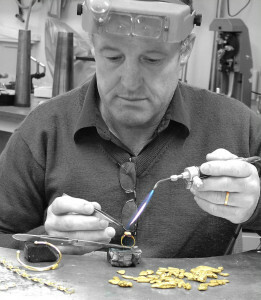 Watch him as he uses his torch to careful heat a natural nugget, then attached a ring to the top with gold solder. This is the first stage in making a nugget into a pendant that you can wear. He may also be rolling out a rod of metal, or drawing wire through a plate to make the necessary size piece of metal he requires. If you catch him on the right day, watch him melting gold to make a wedding band. Gold melts at 1064 degrees Celsius. The polishing room is where all the finishing takes place. There are large rotating buffs, tumbling machine and sonic cleaner to make your special piece come to life. Gold was first discovered by explorers in Westland 1864. 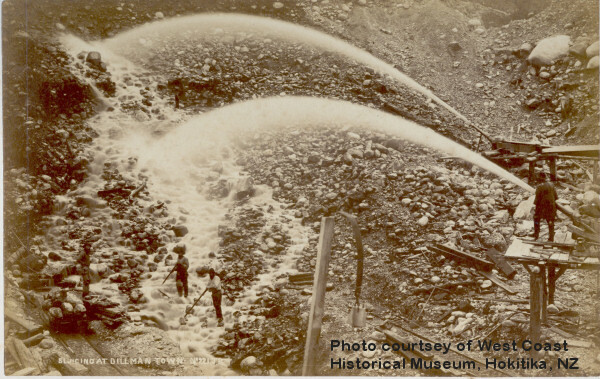 This sparked one of New Zealand’s largest gold rushes and was comparable to the rushes of California in 1849, and Klondike in 1900. It is not surprising that many of the same men were involved, traveling between the California, Victoria Australia and New Zealand goldfields. This also included gold miners from China who first arrived on the West Coast in 1867. By 1871 there were 5000 gold miners from China working the goldfields. Hokitika and its Port became the capital of the bustling West Coast goldfields and at one stage boasted 102 hotels, 84 of which were in endless succession along one of the main streets. Between 1864 and 1871 the recorded gold recovery for Westland was £10,224,311 with an average of £3 17s per fine ounce. Gold mining has not stopped on the West Coast and continues into this modern era. The Gold Room is delighted to be able to offer its unique jewellery to you, and guarantees that all the gold nuggets and flakes used in our jewellery are natural as found out of the ground. They are not man-made, melted, molded or other type of imitation. 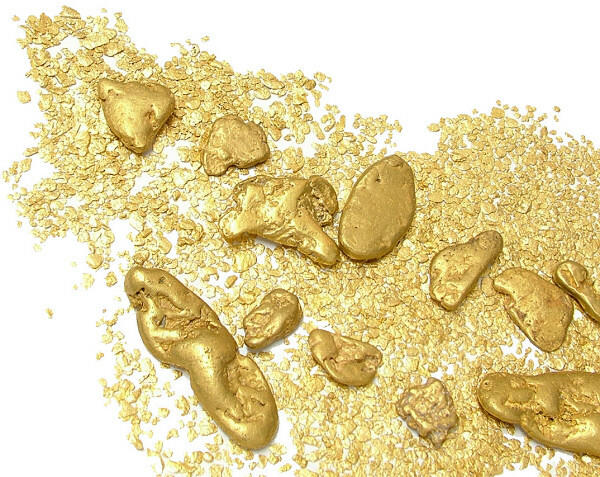 We source the natural gold nuggets and flakes from local commercial mining operations, and individual gold fossickers. During the jewellery making process, we often polished the natural gold to bring out it’s rich yellow colour and attach the natural gold to, or on to, other jewellery parts, but we never alter the nugget from it’s original form. Most of the gold mined in Westland today is alluvial or placer gold, which is in the form of very fine and rare beach gold, small gold flakes, and prized nugget sized pieces. Each nugget is itself unique, with no two nuggets ever exactly the same just like snow flakes. With only approximately 2% of all gold mined in the world today in nugget form, this makes nuggets rarer to find than diamonds by volume, and means gold nuggets are highly sought after and valuable. Not all nuggets are able to be used in the production of jewellery, for that reason jewellery nuggets are even more precious. Westland’s gold is one of the purest in the world being 94% – 98% pure (95.9% = 23kt) in its natural form. This purity gives the gold its rich natural yellow colour. Ancient glaciers and tectonic movements have shaped the gold. 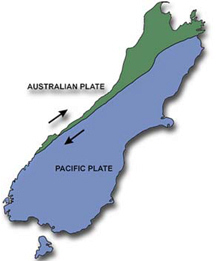 Tectonic forces have crushed and split open the original host quartz veins releasing the trapped gold within. Glacial paths and natural water ways have helped disperse the raw gold. The resultant effects are that West Coast gold is mostly alluvial gold of the flatter smooth variety, and surprisingly hard in its raw form. Many of the same techniques used by the old time miners are still used today, but with the advent of modern equipment and machinery. Water races have been replaced with electric or diesel water pumps. 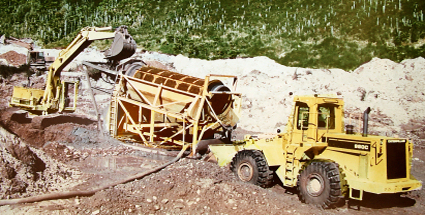 The pick, shovel and sluice water cannon, with earth moving excavators, and the sluice box or cradle with mechanical rotating hydraulic screens. The gold pan is still in as much use today as it was last century. Today it is used for the very end wash up of the riffle tables from the hydraulic screens, and as a simple method of testing new ground for colour. Recreational prospectors and hobbyist can still do well, we have made many gold wedding bands using their hard labours. 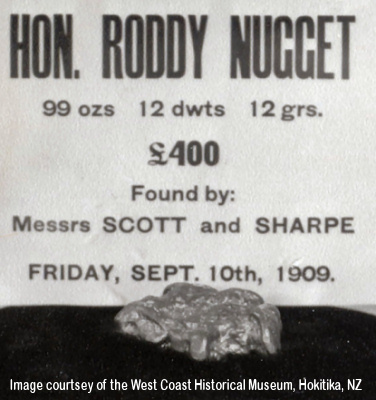 The largest nugget ever found in New Zealand, ‘The Honorable Roddy’, named after the Minister of Mines of the day, Roderick McKenzie was discovered in 1909 just south of Hokitika. It weighted 3.09kg or 99.63oz. It was originally found by Messrs Scott and Sharpe and was brought by a Ross storekeeper and his Canterbury associate. A cast of the nugget was shown in the Canterbury Museum. In 1911 the ‘Honorable Roddy’ was bought by the government. It was mounted in a fitting setting and was presented to King George V of England as a coronation gift from the people of New Zealand. Unfortunately the Palace has no record of what happened to the nugget and it is rumoured to have been melted down to make a tea service. Karat in gold is a measure of purity, not to be confused with diamond carat which is the weight of the stone. Natural gold does not come out of the ground at an exact karat, as it is formed by nature, this is why it is quoted as a percentage pure. To make karated gold jewellery, the gold is refined and then the alloys are added in the right quantities to make the required karat. 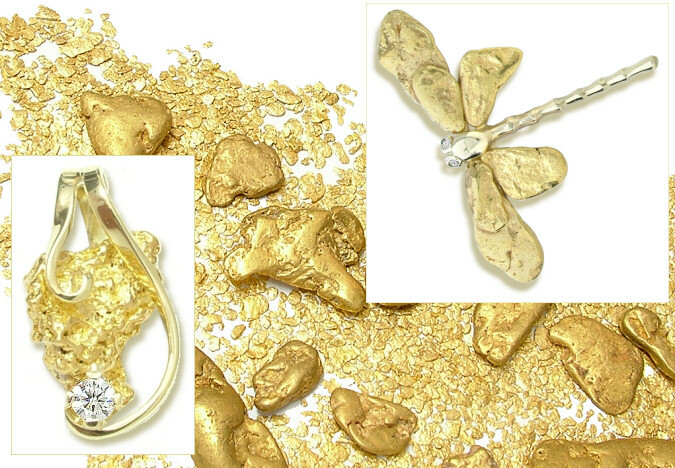 For example, an item in 18kt gold has 75% pure gold content and 25% of alloys. You can have any karat of gold between 1kt and 24kt as it is just a matter of ratio of pure gold content to alloy. 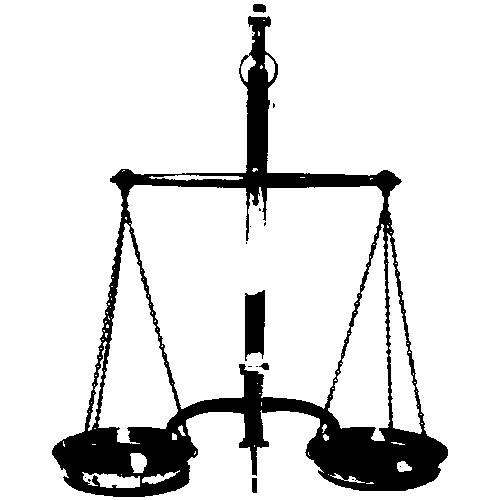 New Zealand weights and measures are in the metric system (gram and kilogram), please be aware of the difference if you are using imperial weights and measures or any other system.